This website provides a service, and to use this service, you have to agree to the following terms and conditions of use. Please read them carefully. If you click ‘I accept’, you would be bound by these terms and conditions. If you do not accept them, you may not be able to use our services. These terms and conditions are governed by and are to be read and interpreted according to the laws of New South Wales. All communications or delivery of trust deeds and other documents you receive from us will be sent electronically via email unless you choose and pay for printing and postal delivery of documents. We take no responsibility if you do not receive emails due to a fault in your computer system. If for any reason, you change your email identity, you will need to inform us in writing from your registered email address. We also do not take any responsibility of any postal delays caused in delivery of printed documents. We however, at our discretion, can provide you a new set of documents without any charge if the documents are damaged or lost in transit. We agree that trust deed, constitution, minutes and other documents purchased from our website will be used by you. You agree that you will not copy these documents in whole or part without our permission. The solicitors who have drafted these documents have allowed you to use the documents once and you agree that you will not create another copy of these documents to be used for any other trust or company. The documents are provided in the form as these are delivered to you. You agree not to modify these documents in any way. You agree that we are not a legal firm and have no intention to give any legal advice. 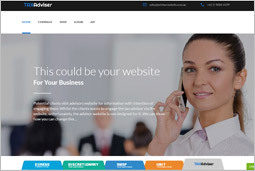 By using this service we are not giving any legal advice. 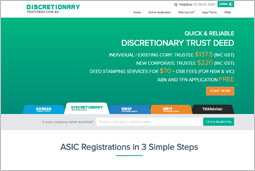 Our service is to register a company by using our online connectivity with ASIC and provide documents relevant to registration of a company & unit trust prepared by a law firm as described elsewhere on our website. Our services do not cover any financial accounting or legal advice and by using our services we do know if the company and/or trust is suitable to your needs or are appropriate to your tax situation. We seek answers to questions, which you provide; based on answers to these questions your company is formed and trust deed, constitution, minutes and other documents are prepared. Some of these questions have explanations, these explanations should not be construed as legal advice, they are provided to help you to answer the questions so that you are able to order documents through our website. You agree that you will indemnify us in relation to any cost, loss, liability, or damage that you or your client, or any party suffers from company registered and other documents generated through us due to inaccurate information provided by you or suitability of the particular structure or failing to seek legal advice. All the documents are prepared by a law firm, we do not warrant the legality, commercial use or tax effect of these documents. You are using our services knowing that you are in a particular circumstance and the company & trust you are forming through us is suitable to your needs. You also know your specific circumstance, purpose of using our service and know the consequence of registering a company and/or ordering Trust. We are assuming that you have taken legal advice and based on that advice using our services. You agree that information provided for registering the company and/or trust is correct. If you give wrong information or do not understand the questions seeking information requested by us, the company might be registered incorrectly and/or other documents generated incorrectly. We will not be responsible for such errors caused by you.Once an application has been submitted, it is not possible to withdraw it unless company application is rejected by ASIC for whatsoever reason.Our online support is provided to assist you; however any support will not be taken as legal advice. 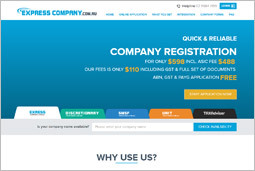 Once you have completed the online application form for registration of the company and paid for it, your application is immediately lodged with ASIC and company is registered usually within couple of minutes. However, the registration may get delayed due to manual processing of application by ASIC or server issues beyond our control. On successful registration of company, all other legal documents would be electronically generated and delivered by email instantly. Our liability would be limited to our service fee paid by you. We will not be liable for registration fee charged by ASIC. By using our service there are no implied warranties provided by us. We may decide to offer to register another company without charging our service fee or to provide another set of documents to compensate your loss; no other warranty or liability will be honoured. We will not be responsible for being negligent on any aspect for delivery of our services. We will not be responsible for any loss, or damage caused to you or cost incurred by you directly or indirectly which arises with use of our services or using our documents. The copyright or ownership of the documents provided by us rests with the law firm which provides us these documents. By using our services, the ownership does not transfer to you. We may decide to change our delivery method at any time.